USED MINI OEM Rear Upper Control Arm for R50, R52, and R53 cooper and cooper S. These are also called camber links. If you've hit something you may have bent one of these. These have been removed from one of our many wrecked MINI's we are parting out. WMW checks them to to make sure they are straight before resale. 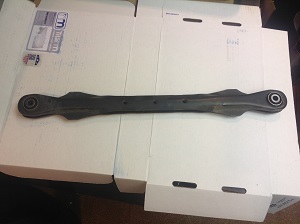 Sold as individual used upper rear control arm.